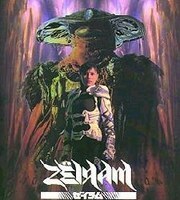 Plot Summary: Zeriam a ruthless Renegade space alien sent to earth by Aliens from the Planet Mays. On Zeriam's tail is Iria a Fearless Space Bonty Hunter sent to capture Zeriam in a Dimensional Zone to limit damage. When two Repairman are accidentaly trapped in the zone, it's up to Iria to save them both . With Bob her trusted Computer and Fantastic wepaons and Armor. Can Iria save the men and stop Zeriam at the same time.